Looking for a quiet neighborhood and ocean views? 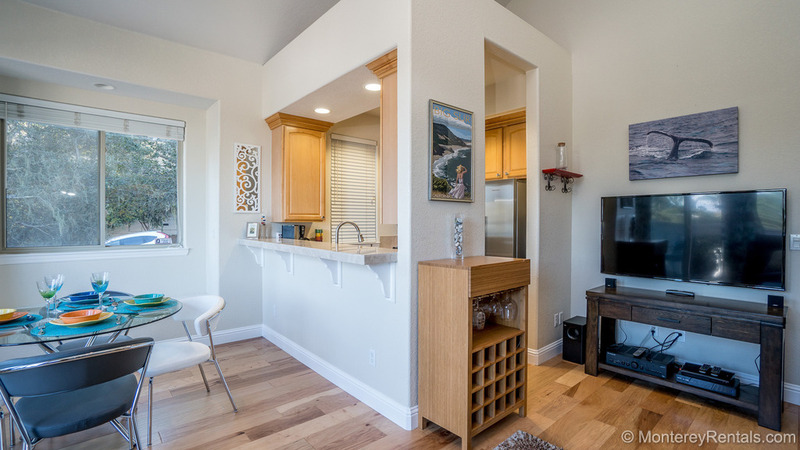 Make yourself comfortable on the leather sofa or the swivel rocker-recliner facing the large flat screen HDTV (with DVR), or enjoy oak-framed views of Monterey Bay from the deck. Time to cook? The remodeled kitchen has high-end stainless steel appliances (Fisher-Paykel side-by-side, Bosch dishwasher, and a GE five burner gas range). Two bedrooms share a hall bath with a tub/shower – and there’s a private half bath in the master. The living areas feature easy care laminate floors; both bedrooms are carpeted. Part of a three unit complex, this condo has a single car garage below (with room for bikes and storage), and a shared coin op laundry in the basement. It’s just one mile to the Aquarium, and a half-mile to supermarkets, restaurants and cafes. Public transportation is a block away, and commuters will enjoy the easy access to Highway 68. High ceilings in living and dining area. Monterey Bay views from the living room and deck. Lovely Monterey Bay views from the deck. Dining table has seating for four. Master bedroom has a private half-bath. Half bath inside master bedroom. Second bedroom has a Queen bed. Full bath in hallway has a tub/shower combination. All living areas are on one level. Quiet, three-unit building in desirable New Monterey.